The attorneys at Parker Law Firm are here to provide both the information and aggressive representation that motorcycle accident victims need. They draw on their knowledge of the law and years of civil law experience to share their thoughts on many common issues related to motorcycle accidents. Start here to find out more about your rights and legal options. If you don’t see your questions, don’t hesitate to reach out! Call their Bedford office today. Can I sue for damages if I wasn’t wearing a helmet during my motorcycle accident? As a Texan, you have the right to not wear a helmet when riding a motorcycle. There has not been a mandatory helmet law in Texas since 1997, although you must be over the age of 21, have taken a motorcycle riding safety course, and carry insurance in order to qualify for the helmet exemption. However just because it may be legal for you to not wear a helmet, that doesn’t mean it’s a good idea. In fact, not wearing a helmet could hurt your chances at a fair settlement when you are injured by another driver. You could be assigned partial fault. Depending on the injuries you sustain, a judge may determine that you contributed to the severity of your injuries by not wearing a helmet. This should not be a factor if you suffered a broken leg or pelvis, but if you sustained a head injury, a judge could rule under the comparative negligence law that you are partially responsible for your injuries. If this happens, the other driver would not be responsible for the entire cost of your medical treatment. Your compensation could be lowered. Even if you are awarded damages, the amount could be lower than what you would have received if you had been wearing a helmet. Medical costs following a head injury can be expensive, and if it is determined that the head injury occurred because you chose not to wear a helmet, you will be unlikely to recover the maximum possible settlement from the other driver. 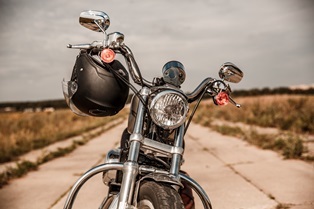 If you chose to exercise your legal right to not wear a helmet and you are injured by a careless or negligent driver, you will need an experienced motorcycle attorney in your corner to fight for the highest possible settlement. Call Parker Law Firm to schedule a case review before you talk to an insurance company. If we think we can help you get the settlement you deserve, we will gladly take your case.